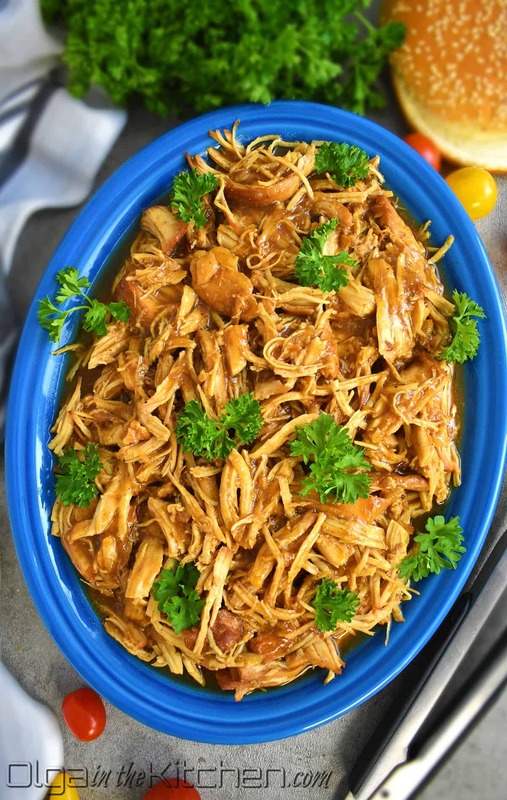 This is the easiest and simply the best Slow Cooker BBQ Pulled Chicken recipe! Fall-apart tender, juicy, sweet, so satisfying and so delicious. 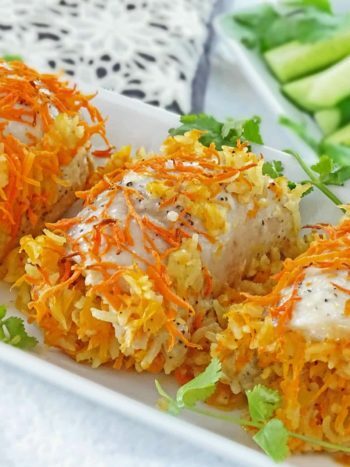 Serve the shredded chicken in buns as a sandwich, on a side of rice, mashed potatoes or on a slice of bread. 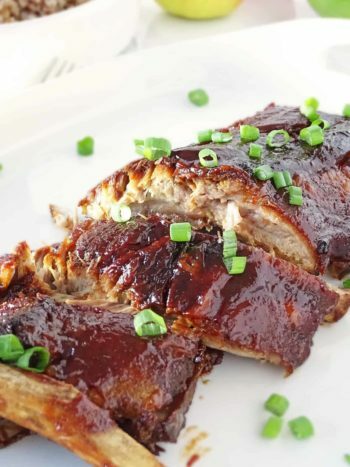 This recipe was created based on our family favorite Slow Cooker Pork Ribs. Both recipes are more on the sweet side, covered in barbecue sauce and both are fall apart. In the ribs recipe, we are using actual honey to give that extra sweetness to the meat. For pulled chicken, we don’t use honey in ingredients, but instead you want to use any brand of BBQ sauce that says ‘honey’ on the bottle. 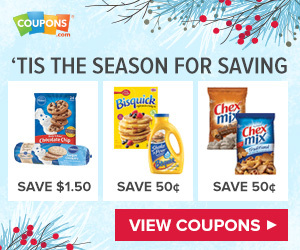 Whether it’s Kraft Sweet Honey, Sweet Baby Ray’s or any other brand. 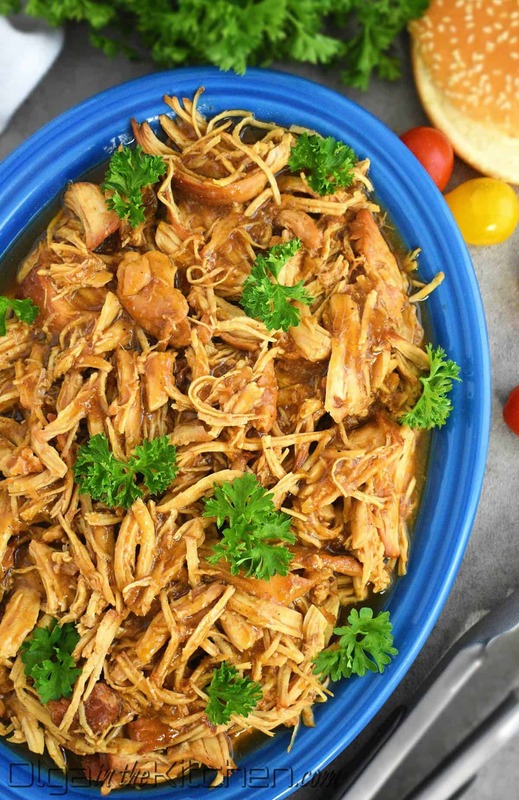 This slow cooker pulled chicken is extremely easy to make. 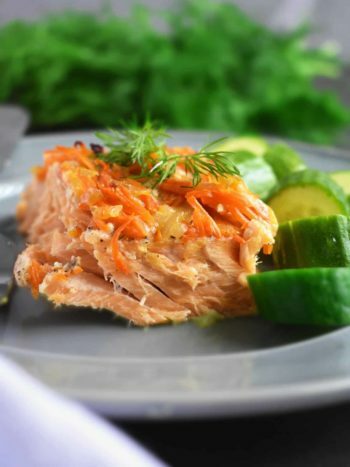 You put everything into the slow cooker without any special prep and wait for few hours to have a ready meal on the table. I cook it for 3 hours on high as I noticed 4 hours dries out the chicken. Chicken breast meat is usually more on the dry side already. Make sure to check if chicken is ready after 3 hours before you decide adding additional hour. Dry meat is not always so tasty. I love slow cooker meals! Every time I have a laundry day, a cleaning day or even a baking day, I’d put everything into slow cooker and not worry about what to eat for lunch or dinner while I’m occupied with other things. I don’t have to stand over the stove and constantly watch it, stir it or mix it. Sometimes I would throw everything into the slow cooker before church and have it ready after church. I don’t do it quite often though because I don’t really feel comfortable leaving appliance on when there’s no one home. Just for safety reasons. 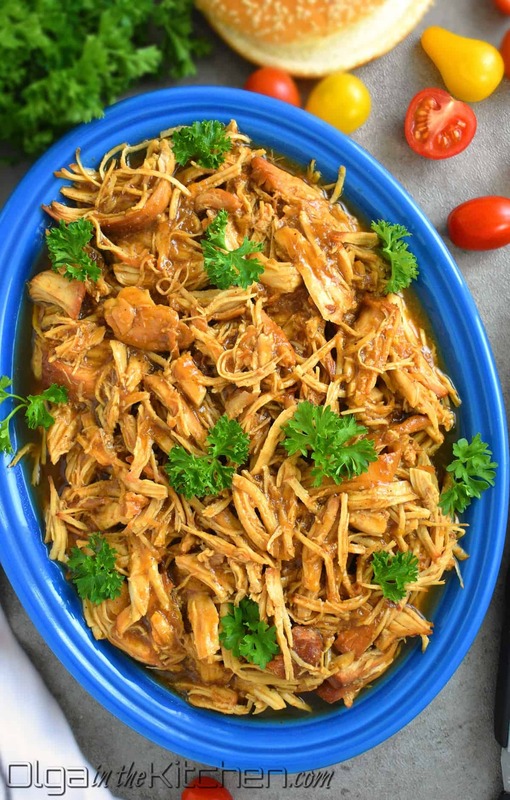 Transfer slow cooker pulled chicken onto a platter or any serving dish and serve as a side dish to rice or even mashed potatoes. 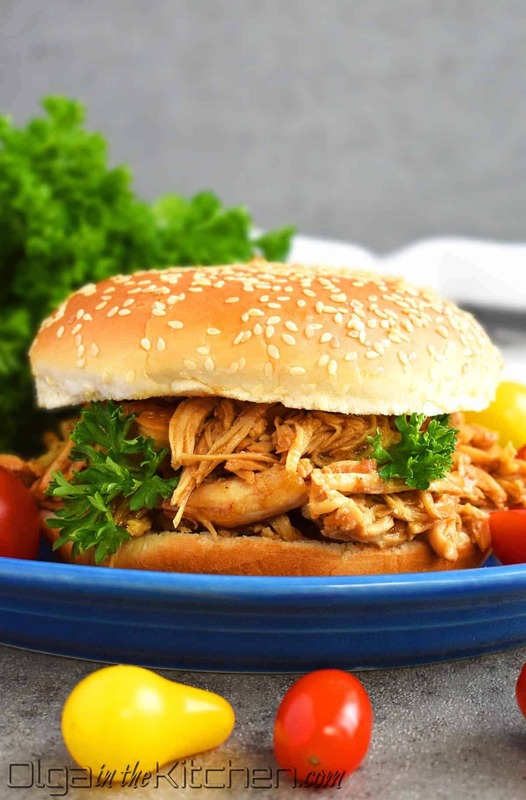 Another great way to serve slow cooker BBQ chicken is in buns as a sandwich or on a slice of bread. 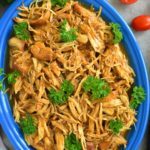 Slow Cooker BBQ Pulled Chicken: fall-apart tender, juicy, sweet, so satisfying and so delicious. Serve the shredded chicken in buns as a sandwich, on a side of rice, mashed potatoes or on a slice of bread. 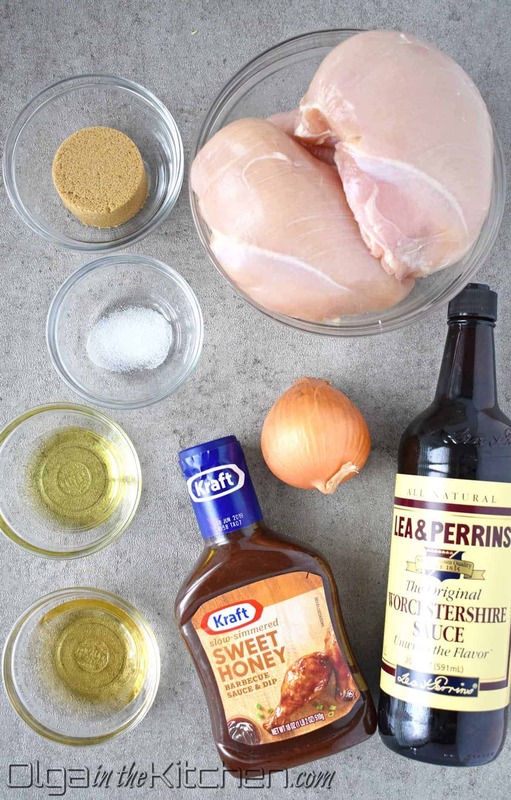 In a 5 or 6 qt slow cooker combine and stir sauce ingredients: 1 cup BBQ sauce, 1 small yellow onion (finely grated, with juice), 2 tbsp apple juice, 1 tbsp vegetable or canola oil, 2 tbsp Worcestershire sauce, 1/4 cup brown sugar and 1/4 tsp fine salt. 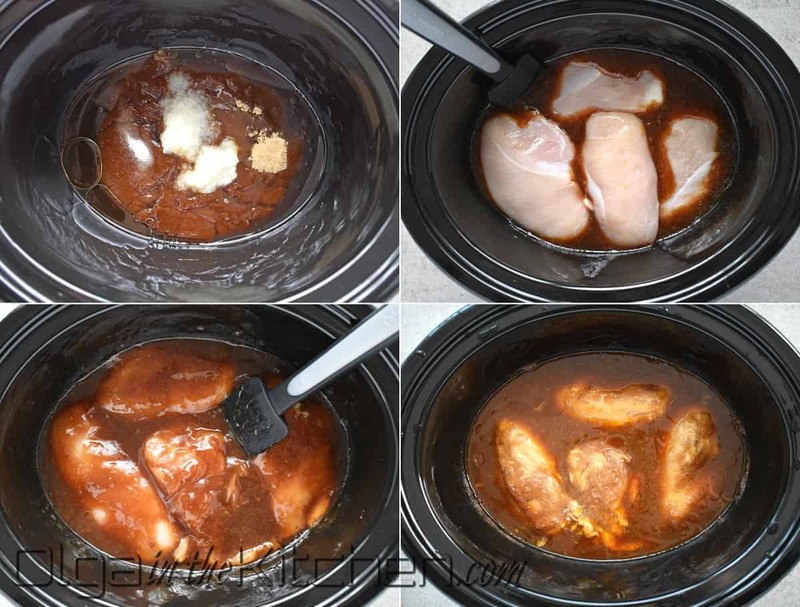 Add 4 boneless, skinless chicken breasts (trimmed of fat – about 3 lbs) to slow cooker and turn to coat. Cover with lid and cook on high for 3-4 hours (or low 6-7 hours). (I did 3 hours). Chicken is ready when cooked through and easy to shred. Remove chicken to a cutting board and shred each breast using couple forks. Transfer shredded chicken back into crock pot and stir to coat with sauce. Serve in buns as a sandwich, on a side of rice, mashed potatoes or on a slice of bread. This pulled chicken recipe is the BEST! I brought it to my work potluck and my co-workers loved it. It’s so flavorful and not dry like other pulled chicken recipes I tried. Thanks Olga! What a great recipe. 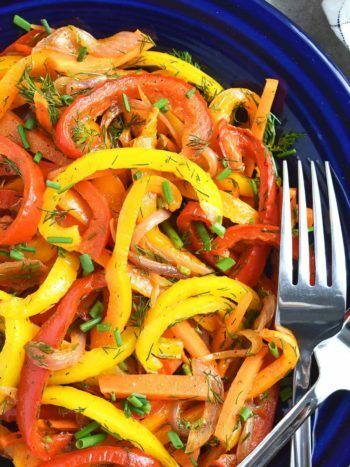 It’s so flavorful and a crowd-pleasing. Will you be posting more slow-cooker recipes? I’m a huge fan of them!